A battle report or After Action Report (AAR) for I Ain't Been Shot, Mum (IABSM), the company-sized wargaming rules for WW2 from the TooFatLardies. A one-off game or scenario set on the Eastern Front in the year 1941. After the success of the latest game of IABSM3, 'A Warm Bed for the Night', I decided we needed to fight another one soon. Paul B was dead keen to have a go on the winter terrain after missing out on the previous game. This time I decided I'd stage it during the Soviet Counter-Offensive of December 1941, with moderate snow fall. Clive and Nige played the German forces again, with Paul T as Soviet CO, not so ably assisted by myself and Paul B. As is typical, I wrote the scenario so gave myself a minor role. The other players did not know exactly what they were facing, and for the Soviets didn't know where the Germans were deployed. The Germans were told which table edge the Soviets would arrive on but that was it. The table set up is shown below on a 6' x 4' standard table. As with all these scenarios you can alter the size of the table, position of the features and force make up to fit with what you have in your collection. The Soviets were tasked with exiting the German long table edge, and the Germans with preventing this happening. The table set up looks deceptively open. The road from the farm to the hamlet was almost a sunken feature as on either side of the road the ground rose up. This extended half way along the small road exiting the German table edge too. The hamlet and farm were quite wide spaced with fences and thickets close by. These thickets also featured extensively along the road making it quite some obstacle and offering a fair bit of cover and an obstruction to line of sight. A small deciduous open wood was located quite centrally and a small frozen pond also featured. The real killer was the weather. This time there was moderate snow fall which penalised all movement rolls by vehicles and infantry by -2", plus falling snow meant that visibility and spotting was impaired. One of the biggest problems with my IABSM games is that we often have two to three players per side and I like to give each player at least a couple of tactical units. This sometimes makes the game too large to fight to a result in a typical three hours evenings gaming. As you'll see, this scenario is a candidate for too big in the circumstances. Click on the briefings below for the full scenario. The Soviets knew the scenario as 'Red Tide' as I didn't want them becoming aware that a tank ace was facing them. The Germans were a very much cobbled together force of a Schutzen HQ Zug; of one rifle Gruppe, a Panzerknacker Gruppe and a flamethrower team, two weak Schutzen Platoons each of two rifle Gruppen plus an AT rifle. They were supported by a weapons Zug; two 81mm mortars and two tripod mounted MG34s, a 7.5cm Infantry Gun, an 8.8cm FlaK gun plus another tripod MG34 for defence, and two StuG III Ausf Ds. Apart from the Infantry gun each tactical element had a Big Man, therefore six in total, with the StuG Big Man in addition being rated as a 'Tank Ace'. The infantry were all rated as Good Regulars, Die Hards and Stubborn in defence in close combat. The Germans were told they could deploy up to 18" on table, but not within 9" of the table edge. The Soviet forces, rated as Poor Regulars though Aggressive in close combat, consisted of Motor Rifle Company of three rifle Platoons, each of three ten-man rifle sections, a weapons Platoon of two Maxim MGs and three 50mm mortars, plus a tank killing section. In addition a tank company of a HQ Tank, and three Platoons each of three T-34 mod. 1940. The Soviets had three Big Men plus a Political Officer available at the game start. The Soviets also had D3 pre-game stonks. I rolled a five thereby giving them three stonks anywhere on the table. The Soviets were told that four blinds per turn were allowed to arrive but two must initially be armour. I didn't actually tell the two Pauls that the tank HQ and one Platoon of T-34s were actually available and arriving after five turns of the blank card. As far as they knew they only had six tanks and not the ten that were actually available. Paul Ts idea was to refuse the right with him and I concentrating on the left rolling up the position. Paul B was told to occupy the open wood in the centre with his infantry and support with his armour, hoping to fix the German defenders whilst we rolled up the flank. Our one dummy blind was to advance threateningly towards the hamlet. With the German with positions marked on a map, our stonks were announced to much Germans surprise. I obviously had no input in where they were to be placed as I knew where the Germans were permitted to deploy. The two Pauls had a chat and decided one on the stonks to land on the open wood, one on the farm, setting it alight, and one on the crossroads. The Germans kept poker faced knowing that only one stonk had actually fallen on their deployment area. With the Soviet blinds advancing onto the table Clive and Nigel pushed a blind towards the open wood. It was spotted fairly quickly by the Soviets as a dummy, but the German spotting was incredibly poor in identifying the Soviet blinds. The Soviet dummy advancing towards the hamlet spotted ahead and was alarmed to discover the 8.8cm FlaK occupying it, with tripod MG34 for close defence. I hardly ever feature 8.8cm FlaK guns in my scenarios, and almost never on table preferring them to be off-table firing onto the table. The consternation shown by the Soviets was matched by the Germans alarm at the Soviet blind racing towards them. There were big sighs of relief however when this was spotted as a dummy. Paul B advanced towards the open wood with my 50mm mortars backing him up. We had attached the Maxims to both of the Pauls's infantry Platoons. Paul Bs left flank was protected by the other Paul's blinds which had been using the Rapid Deployment card to advance past the farm. Spotting up the road, Paul T identified the enemy 7.5cm Infantry Gun. This had lost one man in the pre-game stonk, the only casualty suffered by the Germans. Finally the Germans spotting identified Paul Bs Platoon in the open wood, with its attached Maxim MMG. With little else to shoot at the FlaK gun and its attached MG34 poured round after round, turn after turn into the Soviet ranks. When Paul Bs cards did come up the rare occasion before the German gun's his troops refused to move. Counting -2" on movement dice for snow, and a further -1" for broken ground, the Soviets had a 50% chance of not moving! In reply Paul T spotted up the road and identified the German weapons Zug; tripod mounted MMGs behind a thicket and 81mm mortars behind a bank. These too started firing at their only visible target, poor Paul Bs Platoon in the wood. Clive spotted up the along the road an identified one of the Soviet blinds as three T-34s. 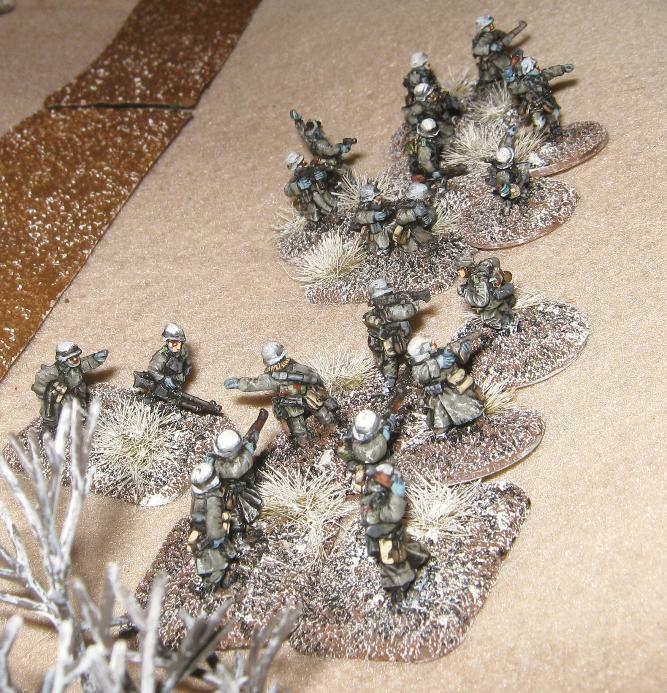 Paul T placed his Platoon with its attached Maxim on table and opened up on the lone enemy Infantry Gun. For two games in a row Paul T destroyed it as the remaining crew died in a hail of gunfire. It was by now obvious that the Soviets were concentrating their attack on the German right. It looked as if the German position would be indeed turned. However, German blinds were placed on the table as Clive and Nigel shifted troops towards their threatened flank from their centre where they had been deployed at the start of the game; a weak infantry Platoon of two Gruppen plus an AT rifle, and the two StuGs. With Paul Ts T-34s crossing the road to face off against the StuGs his infantry advance now stalled badly too. The snow was having a massive effect on the Soviet movement of the infantry whilst the T-34s were less effected by it. The German AT rifle was predictably having little effect on the T-34s but the StuGs were more successful. Things weren't looking good when, with its first shot, a StuG easily despached the lead T-34. This wasn't even the Tank Ace, but his Kameraden. The tank ace then opened up on the second T-34, disabling its main gun. As Paul B finally managed to extricate the majority of his much reduced Platoon from the wood German Schutzen were spotted preparing to defend the bank lined road. The FlaK gun and its attendant MMG now began to concentrate on my three 50mm mortars, quickly destroying two in short order. Paul's T-34 Platoon was rapidly advancing upon the main German position, but was naturally very wary of the enemy FlaK gun hitting them in the flank. Crossing over the bank to deny the FlaK gun line of sight, Paul's T-34s sheltered next to the road, unable to cross the thickets yet. Soon advancing upon them were the tank ace and a flamethrower crew. The flamethrower missed its target but flamed the thicket, with the StuG knocking out a T-34. By now the Soviet Political Officer was trying desperately to motivate the infantry and removing their shock. By now however the Platoon was subject to the attentions of the German weapons Zug and its really nasty 81mm mortars. Round after round piled into Paul's unlucky Platoon. With time approaching midnight we decided to call it a day. Not exactly a successful game. The weather had proved the decisive factor in the game stopping the Soviets getting to grips with the invader. The Soviets had totally underestimated the potential effect of the weather on movement. The Soviet players, with only three activation dice per section at full strength found that they were unable to achieve any momentum, especially once they had acquired shock points and casualties. The few dice we used seemed inevitably to roll a 1 or 2 meaning with modifiers, no movement in the snow. Paul B particularly seemed hung out to dry; harangued by the FlaK gun, its attached MMG, and then the mortars and MGs of the German Schutzen weapons Zug. Once he got his T-34s into the game these were then attacked by a flamethrower and a tank ace. Credit to him, he took it well. I had started the game worried that the Germans might not put up much of a fight, heavily outnumbered as they were, plus susceptible to ammo shortage, fuel shortage and vehicle breakdown. The Soviets had a lot of bad luck though, for as it turned out, for the second game in a row, none of these latter factors hit the Germans at all. The Soviets stonks also proved ineffective, mostly targeting areas where the Germans couldn't deploy anyhow. Then the remaining four T-34s didn't actually show up as it took all evening for five blank cards to turn up. Lack of Soviet mobility due to snow and poor rolling, plus the better trained and led Schutzen, with a large number of Big Men, and then a tank ace too meant that the Germans could react much quicker to the threat of a Soviet flanking manoeuvre. The Human Wave card which normally allows the Soviets to get in close couldn't be played as the Soviets couldn't get near enough to attempt anything like a successful assault. It is difficult to find any positives in the Soviet performance. It was truly woeful. The Germans hadn't really put a foot wrong. They were lucky to avoid a pre-game stonk but then found that the threat of the FlaK gun, the mortars and MGs of the Weapons Zug, and the StuG Platoon was enough to do for the Soviets, struggling through the snow. The vast majority of the Schutzen were unengaged as they were sheltering behind the banked road and largely out of line of sight. I dread to think what the Soviet casualties would have been had they taken a more active role in the defence. German losses were minimal. Only the Infantry Gun and its crew succumbed, plus the odd rare casualty on the weapons Zug. Paul B had taken the majority of casualties on his infantry, stuck in the woods then blasted in the open. The T-34s for two games in a row had now proved underwhelming. Bad optics, a two-man turret and lack of Big Men and radios did not make for an effective armoured force. Really, with hindsight I should have let the Soviets have the entire Company of T-34s from the start and perhaps allowed the Soviet infantry to ride in on their backs. Everyone was very philosophical and stoic about it all though. An interesting and very challenging game indeed, and not one for the fainthearted. Back to the drawing board Ivan.